What’s stressing out your colleagues and employees? Forty-nine percent of Americans surveyed earlier this year reported that they had experienced a “major stressful event” in the preceding 12 months, and work was the leading non-health-related stressor. 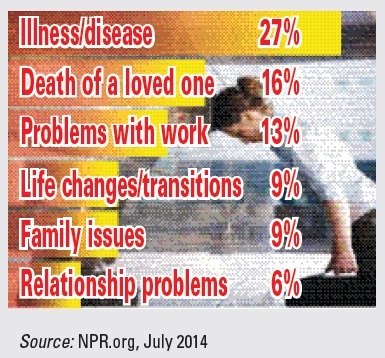 The survey—conducted by National Public Radio, the Robert Wood Johnson Foundation and the Harvard School of Public Health—found that work problems accounted for 13% of major stressful events, trailing only major health problems and the death of a loved one.